This isn’t a full-blown motorhome, but it will give the VW a run for its campervan money. This Mercedes is a classy challenger to the California. In a word: brilliant. Think campervan and your mind immediately wanders to something with a VW badge on the nose. Mercedes is determined to change that notion with its V-Class Marco Polo. Admittedly, with a list price that starts at £53,180 and nudged above £57,500 in the spec we tested, it’s a premium choice. You won’t see this motorhome packing out Glastonbury or filling every campsite in the countryside any time soon. 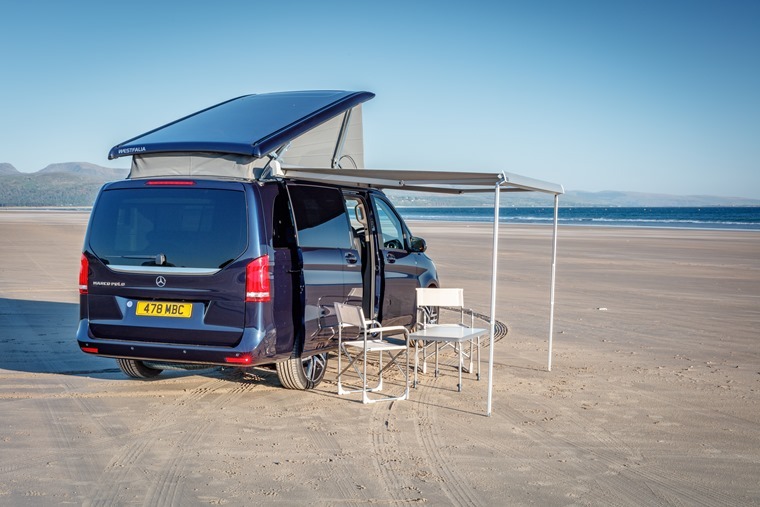 However, by the time you’ve specced a Volkswagen California Ocean to the same level as the Marco Polo’s standard you’ll be paying as much or more depending on how you pick your way through the optional extras. 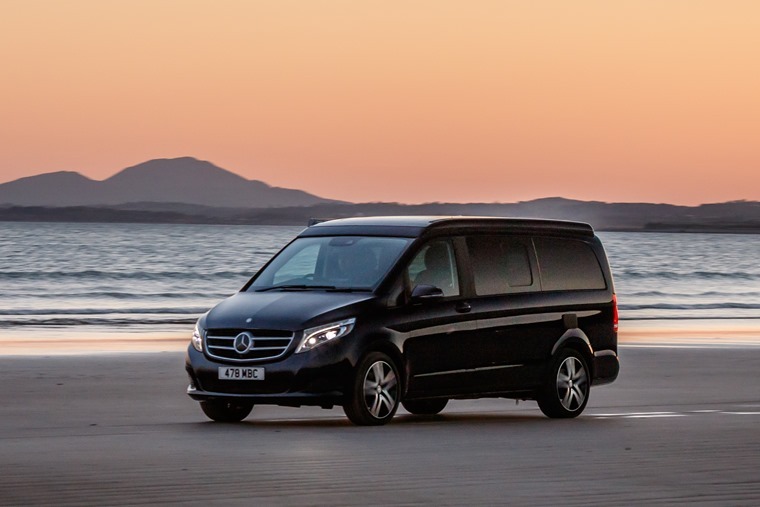 So, Mercedes is in a good position to rival VW at the upper end of the camper market. 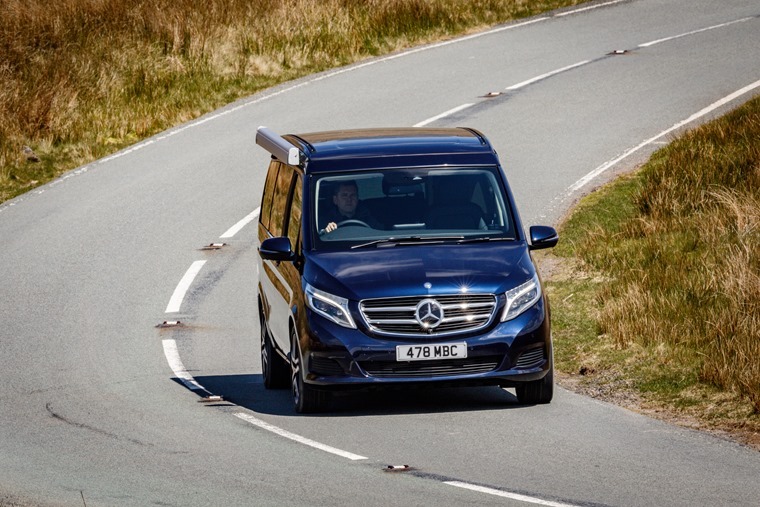 When driven sedately, the V-Class feels very comfortable and capable of the kind of long distances that would see you heading to the further reaches of Europe. So what is the Marco Polo and what do you get for the same prices as a nicely appointed CLS? Well, it’s based on the long wheelbase V-Class people carrier model and comes in 250d form. This brings a 2.1-litre turbodiesel engine, rather than the latest and more refined 2.0-litre diesel from the E-Class, and it’s coupled to a seven-speed automatic gearbox as standard. With 163hp and 280lb ft of torque, performance is adequate rather than spritely. From rest to 62mph takes 12.3 seconds, but you’re unlikely to press it that hard as the engine becomes a little rowdy at its upper reaches. Better to take things in a more leisurely fashion, let the gearbox whirr through its rations smoothly and attempt to get close to the claimed 44.8mpg official combined economy figure. 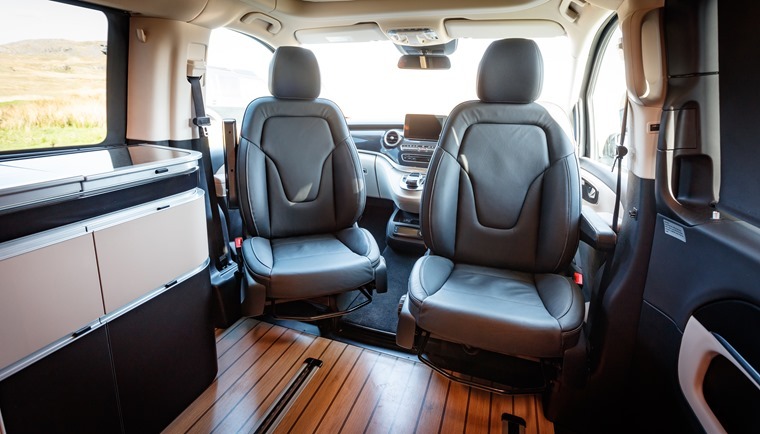 When driven sedately, the V-Class feels very comfortable and capable of the kind of long distances that would see you heading to the further reaches of Europe on holiday. It’s more refined and hushed inside than the Volkswagen and also does a better job of ironing out jolts and bumps, though neither can quite hide their van-based origins when more sudden interruptions appear in the road’s surface. So, what’s like when you park up for the day and get on with your holiday? In a word: brilliant. As for handling, the Marco Polo’s no lightweight and tips the scales at 2440kg before you’ve loaded up the kids, camping gear and grub. Even so, it’s easy to pilot and doesn’t feel overly large as you nip into town or the park. 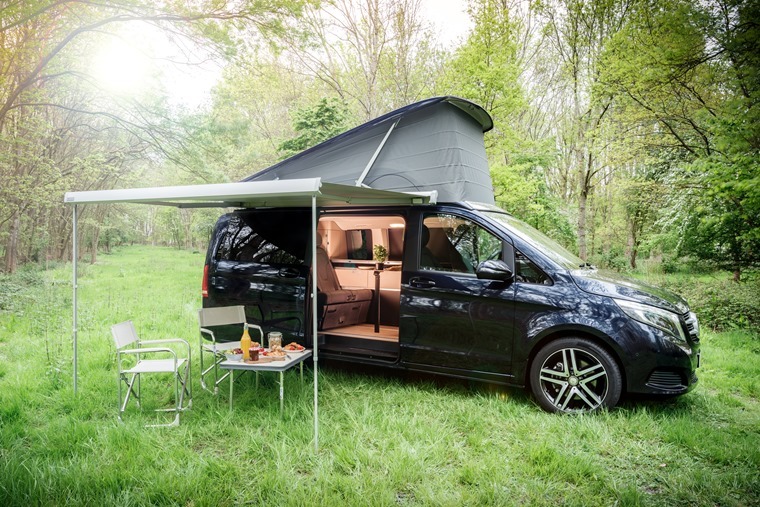 This isn’t a full-blown motorhome, so you don’t get a fully optioned kitchen, internal shower or toilet, but as a way to take off for the weekend or even longer the Marco Polo works superbly. To make the Marco Polo even more habitable, the roof pops up to give more than enough headroom to be able to stand up. An electric sliding side door opens wide to reveal the spacious rear accommodation, however the rear door is on the right-hand side which can be a pain when getting the kids in and out. The rear seat is very comfortable and also slides fore and after so the bambinos can be near or far depending on their mood. On the far wall, there’s a combined unit with sink, double burner hob and a deep fridge, with storage cabinets beneath. More cupboards are built in to the rear of this unit, so it’s easy to stash away food and clothes. Behind the rear seat is the large boot with its split level storage where you’ll find a table and chairs conveniently placed. The upper section of this also doubles as a third of the lower bed, which is created by lowering the rear bench. 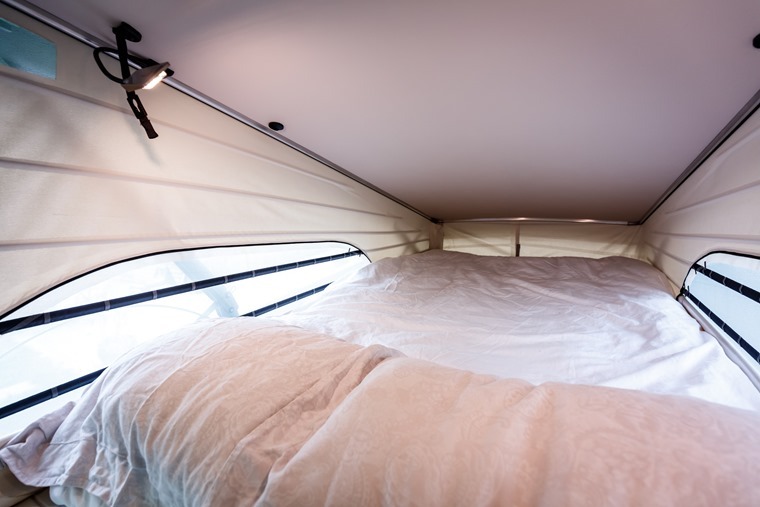 No need for fiddling with levers here as it drops at the press of a button and the cushions also inflate automatically to give a more comfy mattress. We found this ideal for a good night’s sleep and just as easy to stow away in the morning, and when put away there’s a fold out table to serve breakfast on. The Marco Polo packs in a lot of features to a vehicle that outwardly looks like any other V-Class. Of course, to make the Marco Polo even more habitable, the roof pops up to give more than enough headroom to be able to stand up inside the Mercedes. Come the evening, a padded section drops down to make a second double bed and it comes with a safety net so the kids don’t risk rolling out. 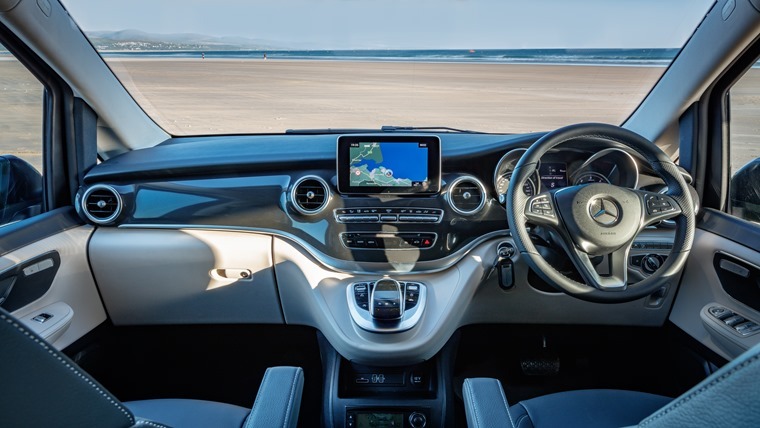 Along with the front seats that swivel to point inwards for the full lounge look, the Marco Polo packs in a lot of features to a vehicle that outwardly looks like any other V-Class. The only giveaways on our test vehicle were the flap for the electric hook-up and fold-out side awning. As a result, you could easily use the Marco Polo as an everyday vehicle when you’re not enjoying the countryside. It also works as the ideal support vehicle for anyone taking part in outdoor pursuits where you’re glad of a hot cuppa and somewhere to relax afterwards. 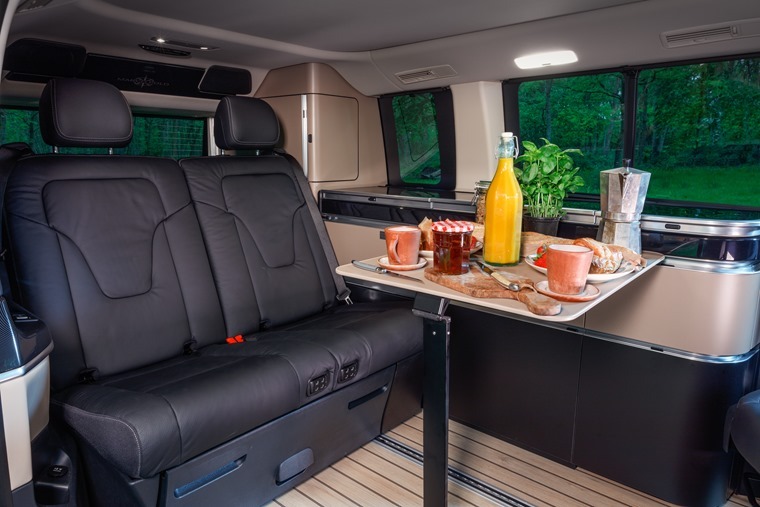 There are cheaper ways into campervan and motorhome usage, but this Mercedes earns its place in your considerations thanks to its convenience, classy build and ease of use. As a result, a three-pointed star on the bonnet instead of a VW badge is worth thinking about next time you’re on the lookout for a camper. *Average monthly lease rates calculated using ContractHireAndLeasing.com data and based on typical 6 + 35 10k deals. Correct at time of writing.